Ontario Yachts took over the Skene molds and continued production with almost no change from the Skene product (addition of OY oval name plate in transom, is the only outward difference between the Skene and OY product. Fiberglass laminate construction. Anti-skid areas on deck and tanks usually coloured in contrast to white surrounding areas. 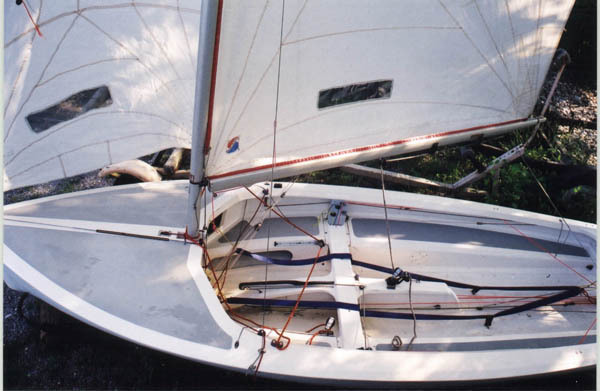 Tapered masts- usually SuperSpars M2, some Proctor D.
Foam Core construction using the same hull and deck tooling as in the Mark 1a boats. Seats/flotation tanks were redesigned forward of the chain plates and consisted of a vee shaped bulkhead from chainplates to centerline just ahead of the mast and a half height bow tank between bulkhead and bow. 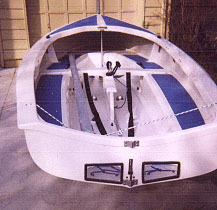 The seats between the thwart and bow tank were opened to provide additional flooding space during a capsize and could be used as storage for wet gear while sailing. Anti-skid areas on deck and tanks sometimes coloured in contrast to white surrounding areas. Tapered masts- usually SuperSpars M2, some Proctor D.
Ontario Yachts Mk 1b #7526 as re-rigged by Hapco Maine in 2002. Note control panels over thwart are not original. Ontario Yachts Mk 1b (#7374) showing half height bow tank with two large opening. Revised bow section of hull, with a finer bow entry. Deck similar to the Mk 1a/1b boats, but set a half inch forward on the hull. Transom sheerline scooped to allow tiller to clear completely above transom. All hulls white (except for a few "eggshell- off white hulls produced around #7940-7950). Anti-skid areas on deck and tanks usually colored in contrast to white surrounding areas. 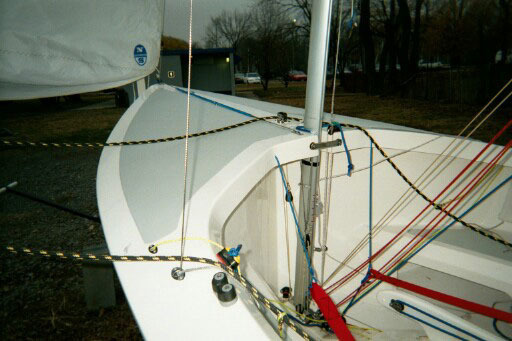 Most boats equipped with foam/fiberglass laminate composite centerboards and rudders. 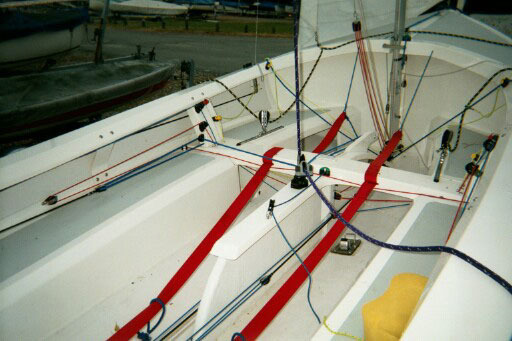 Tapered masts- usually SuperSpars M2.and a Superspar B2 boom. Only difference between Mk 2 a and Mk 2b is foam core construction and tank layout. Mk 2a is glass laminate construction with half height bow tank and aluminum deck strut just ahead of mast. Crew seating area is also a closed floatation tank. Revised bow section of hull, much finer bow entry- more closely approximates Woof bow shape, but was not molded from a Woof. Deck same as Mk 1a/1b boats. Transom sheerline scooped to allow tiller to clear completely above transom. All hulls white (except for a few "eggshell- off white hulls produced around #7940-7950). Anti-skid areas on deck and tanks usually colored in contrast to white surrounding areas. 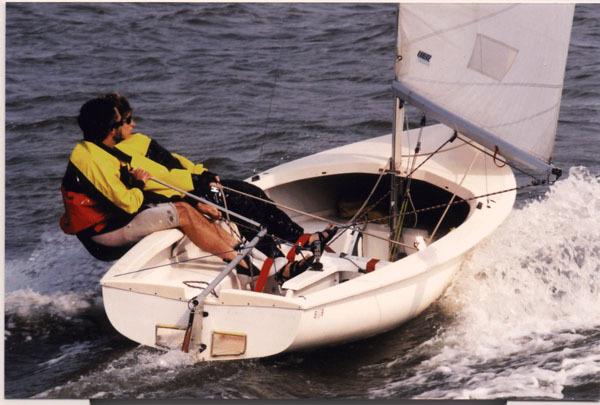 Most boats equipped with foam/fiberglass laminate composite centerboards and rudders. Tapered masts- usually SuperSpars M2, some Proctor D. Only difference between Mk 2 a and Mk 2b is foam core construction and tank layout. Mk 2b is foam core construction with full height bow tank. Most boats have a large open storage compartment in port side of bow tank (Hapco Marine ordered several hulls- 80xx numbers- with full bow tank and no storage compartment). Open area (no flotation tank) below crew seating area. Ontario Yachts Mk 2a #8057 as rigged by Hapco Marine. Note full bow tank without storage compartment. 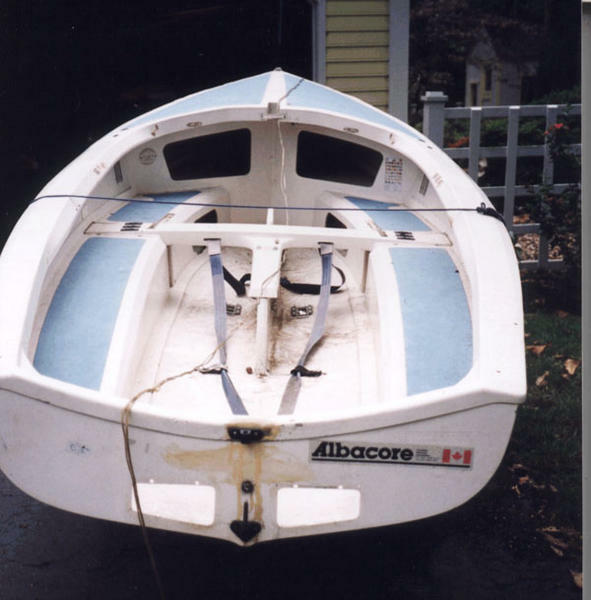 Boats completed by Ontario Yachts have storage compartment. Hapco finished boats do not.